Lingon are very similar to cranberries in flavour (they are actually botanically related too), however they have rarely been cultivated and are usually found wild. They are found in climates ranging from temperate to subarctic and are therefore excellently suited to Sweden (as well as northern Canada, where another variety also grows). Since I've known Jonas, lingonberries have become a familiar part of my Christmas. Like cranberries, they are also excellent accompaniments to game meat, such as reindeer steak and they are also a must-have side to Swedish meatballs. 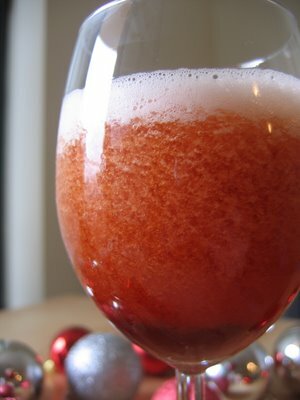 Living in Australia, where Christmas Day can easily be +30’C (+90’F), roasts are not really a fun option and so Jonas and I devised this quick and easy little cocktail to cool off while still retaining some Swedish influence. The tart lingonberries are perfect in this drink. Recipe by Anna & Jonas. Makes 2. Blend ingredients with ice in a blender until slushy consistency. Serve immediately. Note: you can replace any fruit syrup or cordial with the lingonsaft, but lingon cordial is usually available from Ikea worldwide. 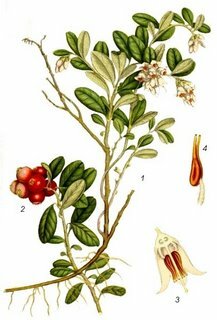 The lingon genus, Vaccinium, also includes blueberries, bilberries, and huckleberries. (Above botanical graphic came from Wikipedia). Of course the word lingon is Swedish, but the berries are also known as cowberries, mountain cranberries, lowbush cranberries, European cranberries, and wild cranberries. The berries are quite tart and so they make excellent jams, compotes, juices and syrups when cooked with sugar. 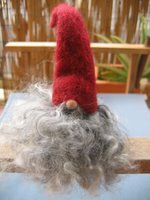 Now if you’re wondering who this strange hairy man is, this is our family tomte. Every Swedish home has a tomte, an old man spirit who cares for you and protects you. But it's got to be two ways: he also demands respect and gifts of appreciation. On Christmas Eve it is very important to leave tomten a bowl of porridge, otherwise he might get very cranky and trash your house, make your butter rancid or tie your cows’ tails together (should you have cows). The historical importance of respecting your house’s tomte at Christmas can be seen by the fact that Swedes call Santa Claus Jultomte (which means 'Christmas tomte'). But since our tomte lives in Australia, porridge is a bit hot for him. Instead he likes to sit back with a nice lingonberry daiquiri while he watches over us. Here is my first contribution to my own Festive Food Fair. 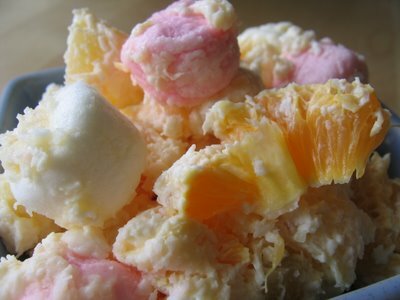 I first tried Ambrosia when I was about 12 years old and it has special meaning to me since it was made by the wife of one of my father's closest friends. It was New Years Eve and all the adults got ridiculously drunk and debauched, and it was at that moment that I realised life wouldn't end when I turned 20. I liked this recipe so much that I asked Bridget to write it down for me. It may even be one of the first things I ever made on my own initiative. When I read the recipe, I was horrified to discover what it was made out of. The ingredients sounded awful together (sour cream and marshmallows!). 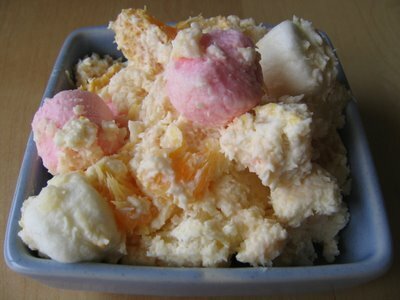 I couldn't believe that the tasty little dessert salad was made from this horrid concoction. It's an excellent salad for a BBQ or as part of a dessert buffet, but I'm not so sure I'd serve it with savoury food as I've heard some people do. Adaptation of a recipe by Bridget Krep. Serves 8. Mix together well and chill overnight. The fourth Monday of every November is a traditional folk festival celebrating the onion: Zibelemärit. Switzerland’s capital, Bern, is the site of this massive market where between 50-70 tons of onions are sold every year from over 300 onion stalls. Another 400 stalls sell desserts as well as garlic and other Allium family members: chives, leeks and shallots. Stalls are stocked with hot Zibelechueche (onion pie) and bowls of Zibelesuppe (onion soup) because the day wouldn’t be complete without indulging in at least some onion flavoured fare. In conjunction with the annual onion market, Swiss food blogger Zorra has announced Monday 27 and Tuesday 28 as international onion days and invited all of us to post an onion recipe. I had to use Gruyère – a salute to our hostess and host country. Perhaps my onions realised the respect I was paying to them, because none of the tear inducing sulphenic acids made it to my eyes (actually, the sulphenic acids react with the moisture in your eyes to create sulphuric acid and that’s what makes your eyes sting). Lucky, because I was cutting up an awful lot. Vegetarian adaptation of recipe by Matthew Kemp (Restaurant Balzac), as printed in Gourmet Traveller November 2006. Serves 4 as an entrée. 1. Heat butter in a heavy-based saucepan over medium heat until foaming. Add shallot, garlic, thyme and a pinch of sea salt. Reduce heat to low and cook, without colouring, for 20 minutes or until softened. 2. Add stock and bring to the boil. Add milk and return to the boil. 3. Remove from heat and process in a blender until smooth. 4. Strain through a fine sieve and season to taste with sea salt and freshly milled black pepper. Serve. The original soup recipe is made with chicken stock and is served with blanched yabby tails, skewered on a rosemary twig and pan-fried until golden. The soup is then scattered with the olive oil used to cook the shellfish. 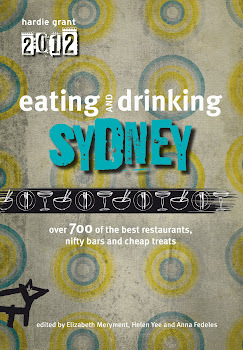 Recipe from Gourmet Traveller ‘Tarts’. Serves 6 as entrée or 4 as a light main. 1. Trim leeks to 12cm long pieces, then halve lengthways. Place pieces in a covered steamer over a saucepan of simmering water and steam for 10-15 minutes or until very soft. Drain well on paper towels, cut side down. Cool then halve lengthways. 2. Melt butter in a frying pan and add shallots, onion, half the thyme and salt and cook over a low-medium heat for 5 minutes. Add red wine vinegar and stir occasionally over low heat for a further 15 minutes or until onion is very soft. Cool. 4. Roll out pastry on a lightly floured surface until 2-3mm thick then trim to a 21x36 rectangle. Using a sharp knife, cut two 2cm strips from the long sides of the rectangle and set aside. 5. Place pastry rectangle on greased oven tray and, leaving a 2cm border on each side, top with onion mixture, ¾ of the cheese and half the remaining thyme. 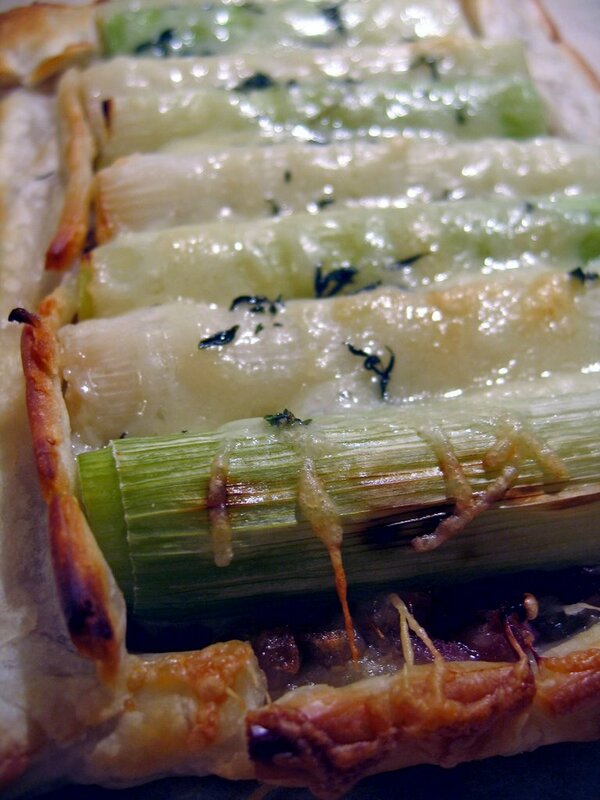 Place leeks widthways across the pastry over the onion mixture. Sprinkle with remaining cheese and thyme. 6. Brush the border with egg and place the reserved pastry strips along the long edges of the border. Brush with egg wash and bake for 15 minutes or until pastry is golden. 7. Stand tart 5 minutes before cutting and serving. The tart was tasty, but steaming the leeks meant they had a very green flavour. 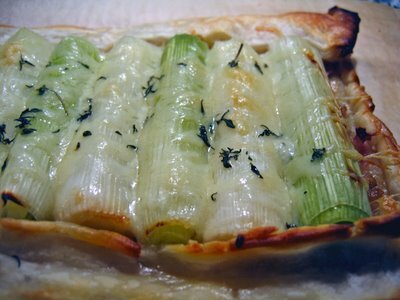 Although it won’t look as pretty, next time I might fry the leeks up too. It seems that shallots and thyme featured in both recipes and that both recipes came from a Gourmet Traveller magazine or book. After eating all these onions, I can smell onion seeping through my pores and on my hands. I once heard this is what happens when you eat too much garlic, but I’d never experienced it myself. I now know what it’s like to reek of onion instead. So get to Zorra’s blog 1x umrühren bitte (aka Kochtopf) to read the onion recipe recap. Happy Onion Day, and don’t cry too much. I love legumes (pulses). 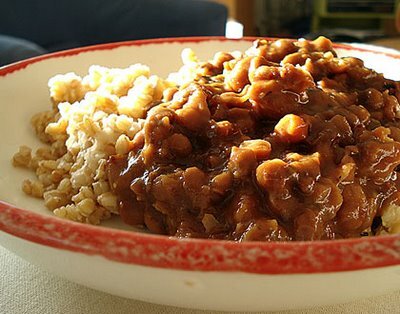 Beans and lentils can be unbelievably delicious. So many people are put off by the texture: firm to touch with a softened core. I simply adore this. Given that Jonas is vegetarian, legumes are my lifeblood at home. I will try to infiltrate them into any meal possible. They provide us both with an important source of protein. To learn more about all the different kinds of legumes (with photos) check out the excellent resource at Cook’s Thesaurus. But for this week’s seven recipes, here are my legume lovelies. Boston Baked Beans comes from Maki in Switzerland (I Was Just Really Very Hungry). What better way to start your day then to breakfast on white beans baked with onions, fresh ginger, garlic, molasses, spices and thyme? The ingredients form a spicy, rich gravy which is enhanced by the smokiness either bacon or chipotle chillies. Photo courtesy of Maki. K'dami are a great snack food from BurékaBoy in Canada (Is That My Buréka?). 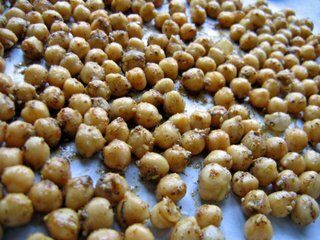 He oven roasts chickpeas (garbanzo) in za’atar, a pungent Middle Eastern spice blend consisting of chopped almonds, pepper, onion, garlic and paprika. Rolled in the spices and olive oil, they are then roasted until crispy. I imagine these would make a great beer snack. Photo courtesy of BurekaBoy. Lima Beans Poriyal are cooked up by Priya in the USA (Sugar and Spice) after she was inspired by a recipe from Indira. 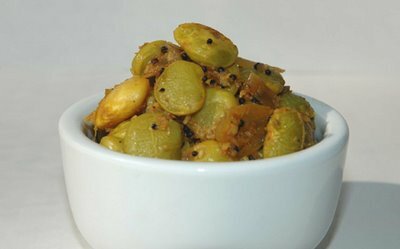 Green chillies are made into a paste with fresh coconut flesh then cooked with mustard seeds, cumin and curry leaves, thinly sliced shallots and garlic until the lima beans are soften and smothered with a rich coating of spicy flavour. Photo courtesy of Priya. 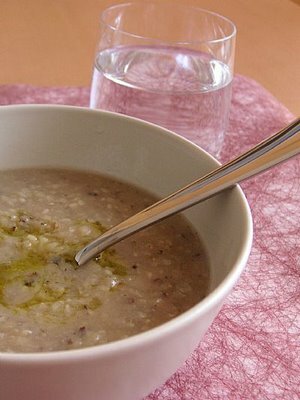 Black Eyed Peas, Savoy & Potato Soup w Bulghur is an inventive combination from Orchidea in Sweden (Viaggi & Sappori). Black eyed peas are softened then the potatoes, onion and cabbage are added. 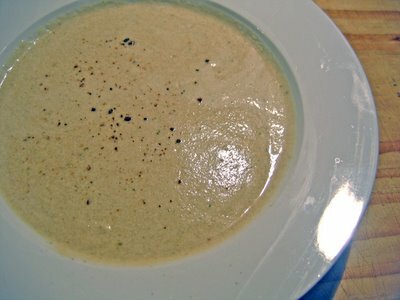 The finished soup is pureed, reheated with the bulghur then sprinkled with olive oil before serving. Excellent comfort food. Photo courtesy of Orchidea. 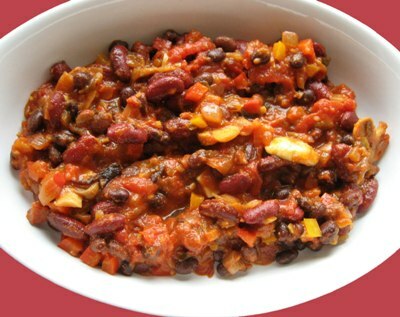 Two Bean Vegetarian Chilli is a hunger inducer from Posie in Switzerland (Posie's Place). To ward away the cold, Posie cooks a delicious combination of kidney and black beans with plum tomatoes, peppers (capsicum), green chillies and mushrooms. They are then flavoured with cumin, onion, smoky paprika and a good dose of garlic. Posie suggests chorizo sausage could be added, but quips that “no meat doesn’t necessarily mean no flavour”. Photo courtesy of Posie. 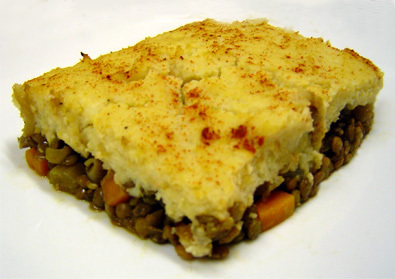 Puy Shepherd's Pie is another vegetarian extravaganza from Mellie in Australia (Tummy Rumbles). Gorgeous slate coloured puy lentils are softened while carrots, onions and celery are sweated into translucency. Kecap Manis, Tabasco and Worcestershire sauces add tang and the traditional potato top is replaced with a nutty cauliflower and chickpea mash. Mellie’s verdict: “fantastically tasty”. Photo courtesy of Mellie. Black Bean & Coconut Drink is from Manivan in Canada (Thai & Lao Food). Manivan uses silky black beans to make a luscious cool drink that could equally classify as a dessert. Black beans are cooked with sugar until soft and then stirred with velvety coconut milk. 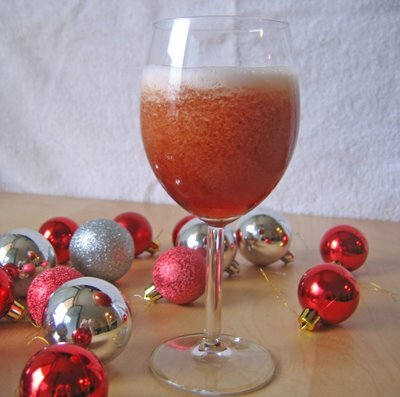 She doesn’t have a photo for this drink but she actually filmed the entire cooking process (with commentary) so I recommend you visit her post and watch her make this delicious drink. Also, next week's Recipe Carousel will be particularly special because it will be the Festive Food Fair round-up, bringing together special ocassion recipes from around the world. Hope you can join the Fair or visit the recap. If you want to link in your own legume recipe and share the love around, just leave the link in the comments section. You didn’t have to invent the recipe yourself, just make it and post it on your site. 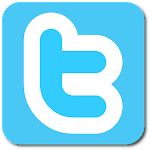 The whole idea of Recipe Carousel is that good recipes are shared with people who love to cook. Check out other Recipe Carousel themes: eggs, pancakes, breakfast, raw food, berries, dips, cocktails, pasta, yoghurt, crispy snacks, vegetable desserts, fruit in savoury food, made from scratch, strawberries, jam, bread, seafood mains, ice cream, soup, chocolate and drinks. 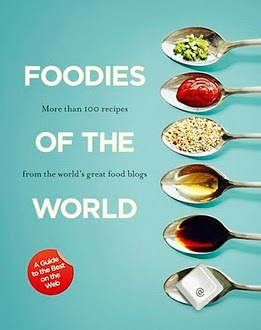 In my quest to cook my way around the world like many fellow food bloggers (such as Margarita and S.C.), I have discovered some very interesting recipes. 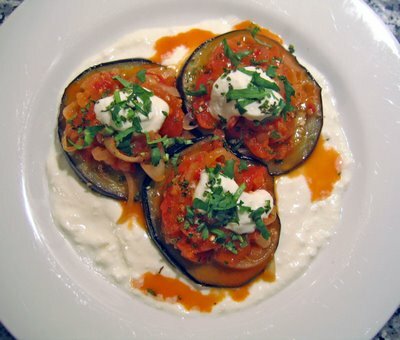 I recently stumbled across some Afghani recipes and one vegetarian dish that immediately caught my eye was the Bouranee Baunjan or Eggplant with Yoghurt. 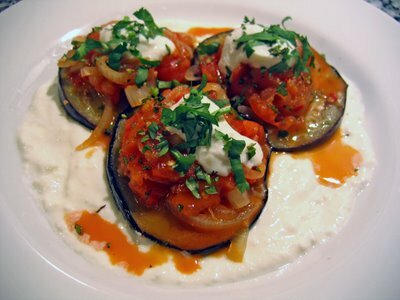 The eggplant is browned before being cooked in a spicy tomato and onion sauce and then served with garlicky yoghurt. 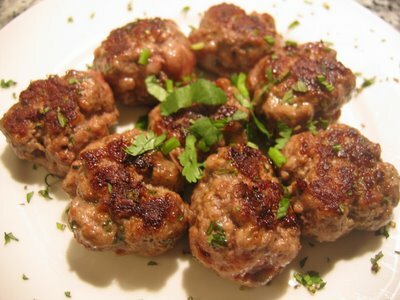 It was simply delicious served with flat bread and I made a few lamb koftas to accompany it. Even Jonas, who detests eggplant, said it was more than palatable. Anna’s version of a commonly distributed internet recipe. Serves 4 as entrée or 2 as main. 1. Keeping the peel, cut the eggplant into 1cm thick (1/2-inch) slices and then sprinkle liberally with salt. Leave for 30 minutes, then pat dry with paper towels. This process allows the salt to draw out some moisture from the eggplant. 2. Heat oil in a deep frying pan and then fry eggplant until lightly golden on both sides (they do not need to be cooked through, you are just adding colour and a bit of flavour). You will need to do this in batches and add more oil as needed. Remove cooked eggplant slices to plate. 3. Oil will leech from the eggplants, so return this to the pan to reheat and then add the onion. Fry until soft. 4. Add 3 garlic cloves, tomato slices and chilli cook until tomatoes break down and a sauce is formed. Add a little stock and seasoning as needed. Remove from pot. 5. Place a layer of eggplant back into the pan. Top with sauce. Repeat using remaining ingredients. Pour in any remaining oil from eggplant and onion and add the remaining stock. Cover and simmer gently for 10-15 minutes until eggplant is tender. 6. Combine yoghurt, salt and 1 garlic clove. Mix well then spread over the base of the serving dish. 7. Top with eggplant slices, lifting eggplant carefully to keep intact. Top with remaining sauce and onions. Sprinkle with some fresh mint and coriander for colour. 8. Serve immediately with Afghani flat bread. Also good with lamb meatballs. Note: The traditional recipe calls for chakah, which is plain yoghurt that has been drained overnight. This makes it a little thicker and drier. Anna’s very own recipe. Makes 10 small meatballs. 1. Mash all the ingredients together with a fork until well mixed. 2. Using your hands, form small balls. Flatten slightly. 3. Heat oil in a saucepan, fry until browned all over (1-2 minutes each side). 4. Serve hot, garnished with coriander and mint. This episode of Weekend Herb Blogging is in Australia and hosted by one of my favourite bloggers, Haalo from Cook (almost) Anything At Least Once. Be sure to check out her blog as well as her recap of this weekend's cooking frenzy. This is just a reminder that the deadline for the Festive Food Fair is Friday 1 December. We've all got one week to post about our "special occasion" recipes!!! With festive seasons in many cultures approaching, there are feasts to be had and food to be cooked. Here is our opportunity to share our special moments with others and learn about food from around the globe. I will compile all the recipes into a recap and then we can all sit back and enjoy the Festive Food Fair. Hope you can make it! 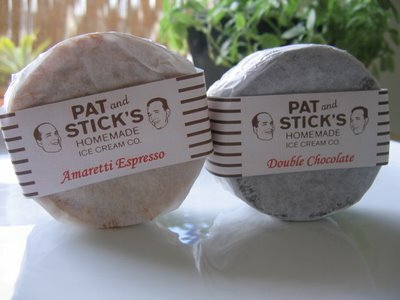 While browsing disinterestedly through an overpriced deli in my local plaza, I happened upon Pat & Stick's Ice Cream Sandwiches. They looked so dainty wrapped in wax paper and secured by a pastel pink band with Pat & Stick's chocolate brown branding. I simply couldn't resist, but should I go for the pretty box of four or just the one? After much deliberation, I bought two to share with Jonas: the double chocolate and the amaretti espresso. 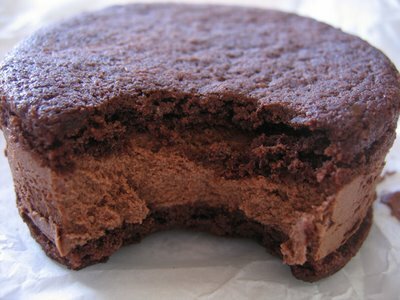 Rich Belgian couveture chocolate ice cream with a choc-fudge cookie. Amaretti and almond lace cookie with a seductive espresso ice cream. 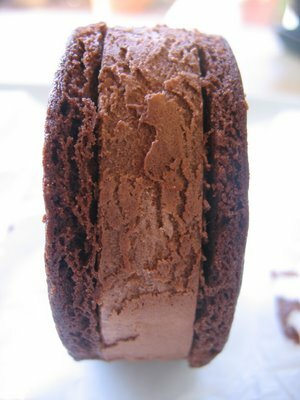 Being the chocolate fiend that I am, the Double Chocolate was my pick while I selected the Amaretti Espresso for Jonas. Funnily enough, we swapped in the end because we preferred each other's! 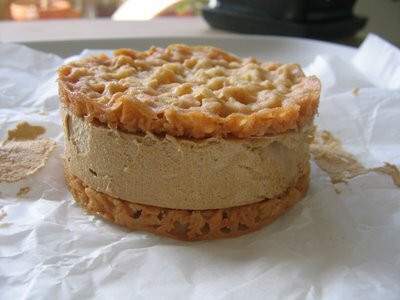 I adored the bittersweet creaminess of the coffee ice cream and the delicious crunchy almond biscuit. Jonas liked the cakey, soft chocolate cookie and the light, milky Belgian chocolate ice cream. Regardless, in the end we were both more than happy. They are expensive, but they're special. It's a childhood memory converted into adult decadence and it's not just the edible part that's fantastic. The packaging is equally seductive in it's quaint, retro style. I am hooked and, since I had a look at all the amazing flavours on their website, I am determined to try more! I love the look of Mango Shortcake (smooth mango ice cream with a delicate shortcake cookie); Peach Party (sweet peach ice cream sandwiched between a vanilla-chocolate cookie); Bananarama (rum flambé banana ice cream and a banana bread cookie) and Christmas Cookie (gingerbread with an ice cream medley of glace fruits, rum, pistachios and chocolate). If you're interested to learn more about Pat & Stick, I found this great article from the Sydney Morning Herald. I love learning how great ideas transform into success stories, especially when it involves food! Nandita’s Weekend Breakfast Blogging challenge this month was “Baking for Breakfast”. The whole idea was to use your baking skills to devise an exciting breakfast option to share with the rest of the WBB bloggers. 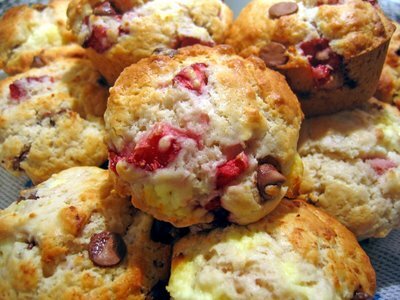 A few weekends ago I made this recipe for muffins baked with ricotta and choc-chips. 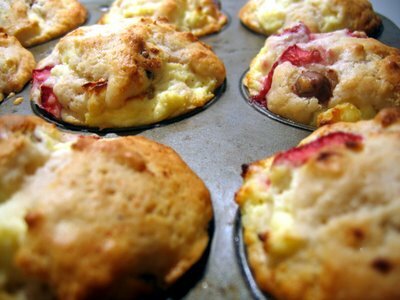 The idea came from Bar Cupola, a café in my office building, who used to bake their own tall, wonderfully moist muffins using chunks of fresh fruit and creamy ricotta. Here I came up with my own replication so I could enjoy the muffins at home on the weekends. They came out perfectly: the ricotta and fruit adding extra moisture. Anna’s very own recipe. Makes 12 large or 24 small muffins. 1. Preheat oven to 200’C. Grease muffin tin. 2. Combine honey and ricotta and pack firmly into a ramekin or small baking dish. Bake for 15 minutes or until slightly golden on top and almost firm to touch. 4. In a large bowl, sift flours, sugar and cinnamon from a height to aerate as much as possible. 5. In a separate bowl, beat egg, oil and milk together. 6. Pour wet ingredients onto dry. Add choc-chips and strawberries. 7. Stir mixture with a fork until moistened and just combined. Mixture may seem lumpy but do not beat or over stir. The less you stir the softer your muffins will be. 8. Half fill each muffin hole with mixture. Be sure to include strawberries and choc-chips in each muffin. 9. Divide baked ricotta between muffins. Top ricotta with remaining muffin mixture then, using a teaspoon, swirl mixture and ricotta slightly. 10. 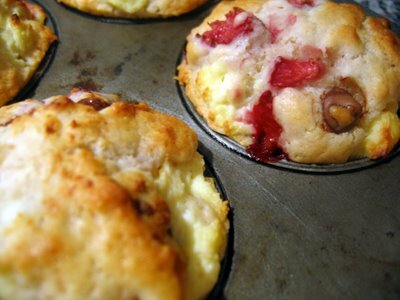 Bake muffins in oven for approximately 15 – 20 minutes or until risen and slightly golden. 11. Remove from oven. Rest for 1 minute then turn out. Serve warm. Variation: instead of strawberries, you can use banana, pear, peach, apricot or any kind of berry. 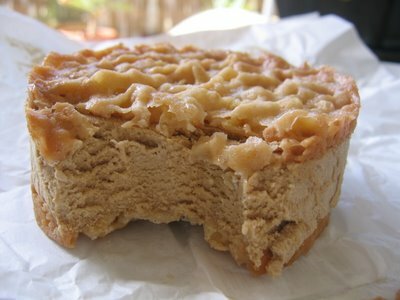 Be sure to visit Nandita's round up so you can discover other baked breakfast beauties. We’ve been on a bit of a trend at Recipe Carousel, with the past two weeks being pancakes and breakfast themes. The whole idea was to encourage people to eat more than eggs in the morning, but I don’t want people to think I’m anti-egg. That’s not the case at all. In fact eggs can be cooked in a variety of fun and unique ways. So here are seven egg recipes to get your noggin’ thinking. Uva e Pomarola (Eggs in Tomato Sauce) is a nifty recipe from Ilva in Italy (Lucullian Delights). 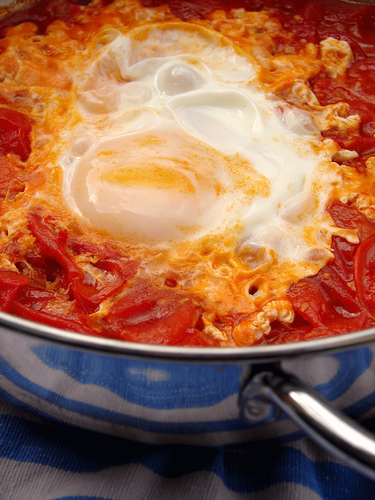 This deliciously simple dish could be prepared for breakfast, lunch or dinner and is made from fresh tomatoes, chilli, onion, garlic and eggs. Photo courtesy of Ilva. 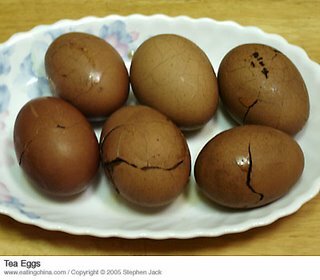 Tea Marbled Eggs (茶葉蛋 cha ye dan) are a recipe from Stephen in Taiwan (Eating China). The slightly boiled eggs have their shells cracked lightly to allow flavour to pervade and then they are simmered in an aromatic combination of black tea, star anise, mandarin peel, soy sauce and cinnamon. This is a common snack food in China. Photo courtesy of Stephen. 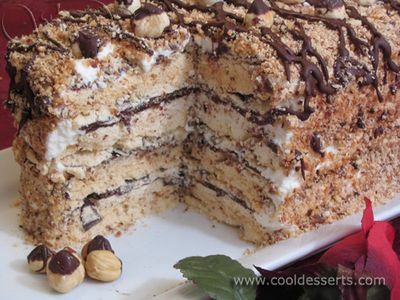 Hazelnut Meringue Cake is a show stopper from Pastry Chef in Canada (My Cool Desserts). Here a hazelnut flavoured meringue is topped with layers of melted chocolate, Frangelico flavoured whipped cream and hazelnuts. Divine! Photo courtesy of Pastry Chef. Curried Stuffed Eggs come from Kalyn in the USA (Kalyn's Kitchen) as she uses her friend, Karina’s, cookbook. 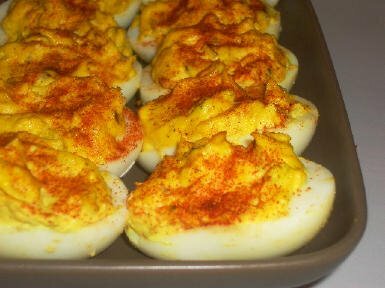 The yolks from halved hard boiled eggs are mashed with mayonnaise, red wine vinegar, Dijon, onion, chilli and curry powder then stuffed back into the egg white halves. Garnished with paprika and coriander, this is an excellent appetiser for any occasion. Photo courtesy of Kalyn. 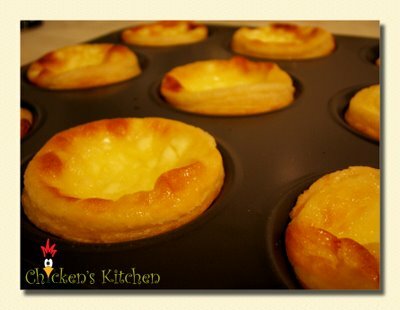 Portuguese Egg Tarts are gorgeous looking treats from Mrs Baasje in the UK (Chicken’s Kitchen). Egg, milk, cream cheese, cream and sugar make this dessert easy and simple to make. Just whip them up and bake until set and browned. I suppose if you’re feeling really cheeky you could eat them while they’re still warm. Photo courtesy of Mrs Baasje. 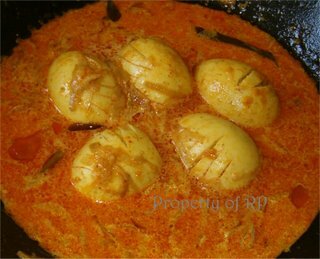 Egg Curry was made by RP in the USA (My Workshop). Onion, garlic, curry leaves, fresh ginger and green chillies flavour a curry made of tomato and masala powders (coriander, chilli, tumeric, garan masala). Finished with coconut milk, these eggs couldn’t have been treated better. Delish! Photo courtesy of RP. Baked Sweet Potato w Eggs & Harissa is a fun, spicy treat from Santos in Guam (The Scent of Green Bananas). A sweet potato is baked until tender then hollowed out. The pulp is mashed with harissa (North African chilli paste) then stuffed back into the potato shell. 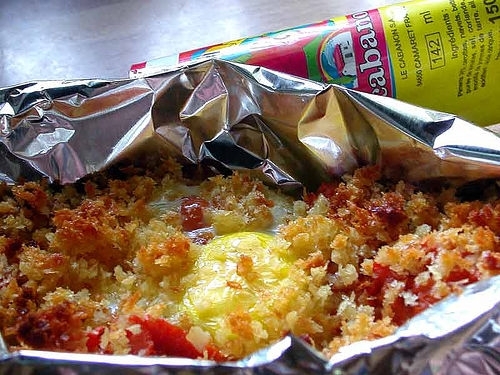 It’s then topped with an egg and breadcrumbs and baked again until the egg has set. Photo courtesy of Santos. If you want to link in your own pancake recipe and share the love around, just leave the link in the comments section. You didn’t have to invent the recipe yourself, just make it and post it on your site. The whole idea of Recipe Carousel is that good recipes are shared with people who love to cook. Check out other Recipe Carousel themes: pancakes, breakfast, raw food, berries, dips, cocktails, pasta, yoghurt, crispy snacks, vegetable desserts, fruit in savoury food, made from scratch, strawberries, jam, bread, seafood mains, ice cream, soup, chocolate and drinks. I must confess I didn’t cook this. I bought the cookbook, picked out the recipe but Jonas did the hard yakka. This Indonesian recipe is based on a traditional sambal and uses galangal. Galangal is part of the ginger family and is considered a herb since its rhizome (root) is used in cooking throughout Asia. There are four kinds of galangal, each with their own level of potency, but overall the flavour is similar to ginger but more pungent and spicier. Recipe from “The Australian Women’s Weekly New Curries”. Serves 6. 1. Blend or process chilli, onion, garlic and galangal until smooth. 2. Heat oil in large saucepan and cook chilli mixture with coriander, curry leaves and kecap asin, stirring, for 5 minutes or until fragrant. 3. Stir tomato, tomato paste and stock into mixture. Cover and simmer for 30 minutes. 4. 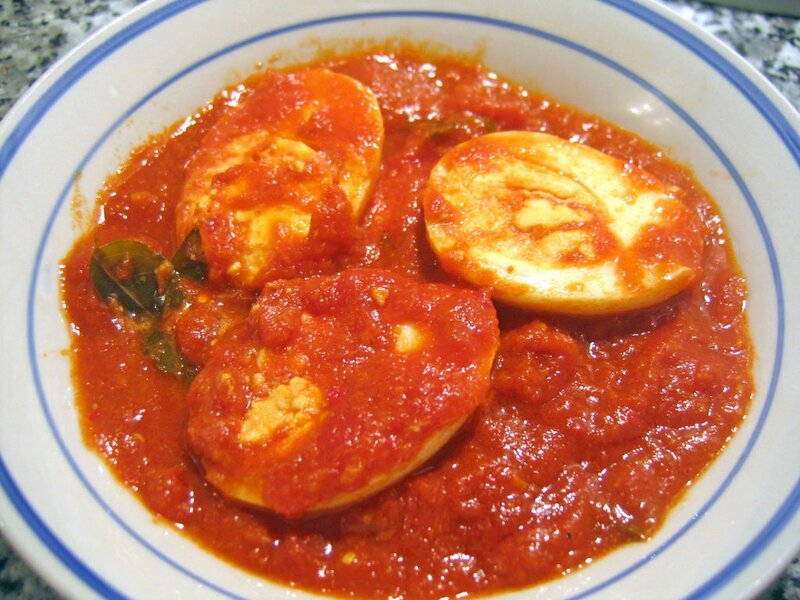 Add eggs, cover and simmer until sambal is heated through. Serve with steamed rice and fresh green vegetables. This is my contribution to this week's Weekend Herb Blogging, hosted by Nandita at Saffron Trail. Please visit her blog to see the round-up of all the recipes from this weekend. For a long time I’ve been meaning to go through my spice rack and list all the items there. I did it for my fridge and freezer back in May and I did my liquor cabinet in June. Now I have an open invitation to do my spice rack from Rowena at Rubber Slippers in Italy. After cleaning through her spice rack, Rowena wondered how other people use their spices and developed a series of questions. Although not a meme, if anyone is interested in taking part just blog about your own spicy experiences and shoot Rowena an email. Black pepper. Ever since I was a wee one these two have been so important to me. My parents didn’t use much salt in their cooking (Australia went through a salt scare in the 80s) so food was flavoured with pepper rather than salt. I simply adore freshly milled black pepper. Dreamy. As I got older I started with chilli too, but pepper always remained in my heart. I use cassia a lot. It’s also known as “baker’s cinnamon” because it has a much stronger flavour than cinnamon and packs a real punch. I only use it in sweet food though because for some strange reason I hate cassia/cinnamon in savoury food (there’s goes all North African cuisine!). Szechwan pepper. It seemed like a good idea at the time but whenever I mill it the texture becomes gritty in the food. I also don’t like sea salt over my food as a seasoning for the same reason – it feels like there’s sand and shells in the food. Wow, I never realised how fussy I am about textures! Lemon myrtle is another unused spice. It’s an Australian native and extremely pungent (almost eucalyptus) so has to be used sparingly. I’ve been trying to get my hands on wattle seeds for a while now. They’re native to Australia and add a coffee-chocolate flavour to desserts. Another Australian native I’d like to cook with is the akudjura or bush tomato. They are supposed to be very strong and taste sweet on entry with a lasting acidic end. The other spice I’m after are nigella seeds. No, these are not named after the Domestic Goddess but are pungent members of the buttercup family. The seeds are also known as kalonji and have a peppery onion flavour. Nigella seed is used a lot in Indian cooking, for instance in the five spice mix panch phora. Peppermint water is great for indigestion. I had a lot of tummy problems as a kid (maybe it was all that pepper and chilli) and I found peppermint water to be wonderfully soothing. Jonas' flu remedy is arguably the world’s most disgusting drink: honey, crushed garlic, grated ginger, lemon juice and a bit of chilli with hot water. It’s foul but he swears by it. I’m still skeptical. spice mixes – “Season All” + "Cajun" + "Mexican" + "tagine"
So what's your favourite and least favourite spice? Let Rowena know! Growing up as a kid my Dad made the best pancakes in the world. He made huge fluffy American style ones that a kid could get lost in. I would drown them in butter and maple syrup, or eat them cold with jam. Then Jonas came into my life with his Swedish style pancakes, soft and flat like crepes and it seems now I prefer the thinner ones. More dense than soft and cakey. I drown these in maple syrup too. Not real maple syrup either. I grew up on maple flavoured syrup. As an adult I was panting like a puppy to try real Vermont or Canadian maple syrup, but when I did I was so disappointed with the subtle, elegant flavour. It was simply too mild after years of maple flavoured bludgeoning. I have never successfully made the transition to real maple syrup, which is something I’m a little ashamed of, but in the end I want to eat what I like and in this case I like the synthetics. Last week Recipe Carousel focused on breakfast, with the omission of pancakes. This week pancakes have their own special place, with seven recipes, both sweet and savoury. Kalingad Ghavan are watermelon pancakes from Ashwini in the USA (Food for Thought). These candy coloured snacks are light and fruity, made from fresh watermelon, jaggery and cardamom and come from India’s Konkan area. The recipe was made by Ashwini’s grandmother, who would use the white rind of the watermelon so as not to waste a thing, but these days you can use the fruit flesh to obtain that wonderful pink colour. Photo courtesy of Ashwini. Brie & Apple Pancakes with Crispy Pancetta is an interesting combination of sweet and savoury from Johanna in the UK (The Passionate Cook). Her recipe was based on the book of another food blogger, with the addition of a little Johanna flare thrown in too. Brie and apples are chopped finely and folded through pancake batter flavoured with cinnamon and buttermilk. The pancakes are served with luscious crème fraîche and strips of crispy bacon. Photo courtesy of Johanna. 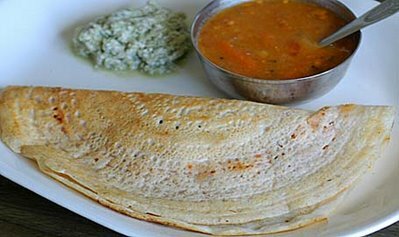 Masala Dosa is a favourite of Indira in India (Mahanandi). These crispy pancakes are eaten with chutneys or relishes or in the case of Masala Dosa, they are filled with spicy potato curry. Indira provides step by step instructions, with photos, on how to make this gorgeous lunch or light snack. Watch out, soon you might be dining in one of Indira’s franchise. Photo courtesy of Indira. 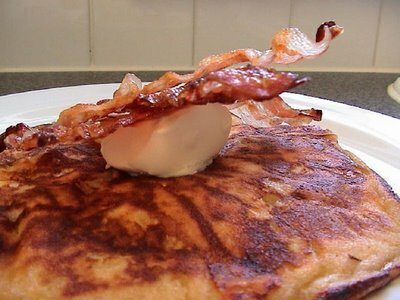 Oatmeal Pancakes is a magnificent pancake recipe from Elise in the USA (Simply Recipes). 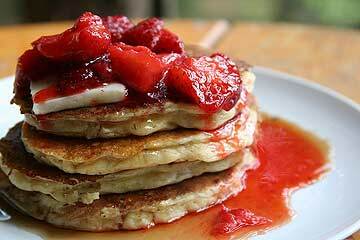 She soaks oats in buttermilk overnight then fries up these delightfully light looking griddle cakes. Topped with maple syrup and fresh fruit, how could anyone say no? Photo courtesy of Elise. 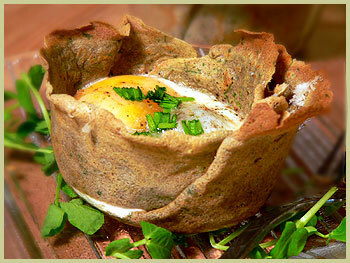 Galette aux Herbes et son nid d’Oeuf is an egg baked in a herb galette nest from Béa in the USA (La Tartine Gourmande). Inspired by memories of greedily gobbling down crêpes while her mother cooked, Béa devised a savoury recipe making a nest out of buckwheat, coriander and parsley to bake a mixture of egg, mushrooms, herbs and pancetta. She also explains that crêpes are sweet whereas galettes are savoury. Mon Dieu! French can be a tricky language. Photo courtesy of Béa. Banh Xeo are Vietnamese style pancakes, served up to us by Helen in Australia (Grab Your Fork). 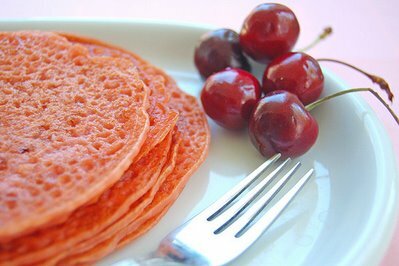 Helen artfully argues that these pancakes, with their lacy, crunchy texture, are the perfect meal for fried food lovers because they still contain healthy ingredients. 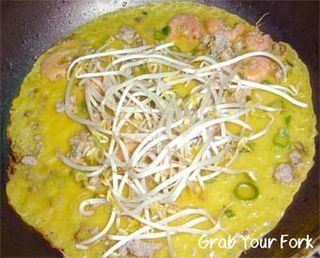 The pancakes are flavoured with shallot, prawns and pork and then filled with fresh bean sprouts. Served with mustard greens, Vietnamese mint, Vietnamese basil, coriander, shiso and nuoc cham (a tangy fish sauce, chilli and carrot dressing) you get more than your share of greens. Photo courtesy of Helen. 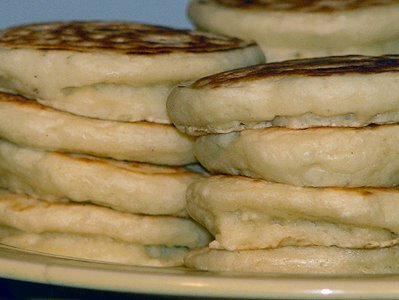 Buttermilk Pancakes are fluffy flapjacks from Jessica in the USA (Pease Porridge). A snow storm forced the family to shelter in their cosy home and feast upon pancakes. Real butter and real maple syrup is the rule in this house and these pancakes look superb. Photo courtesy of Jessica. And sorry to everyone that Recipe Carousel was a bit late this week. Blogger just didn't want to open for me! If you want to link in your own pancakes/crepes recipe and share the love around, just leave the link in the comments section. You didn’t have to invent the recipe yourself, just make it and post it on your site. The whole idea of Recipe Carousel is that good recipes are shared with people who love to cook. Check out other Recipe Carousel themes: breakfast, raw food, berries, dips, cocktails, pasta, yoghurt, crispy snacks, vegetable desserts, fruit in savoury food, made from scratch, strawberries, jam, bread, seafood mains, ice cream, soup, chocolate and drinks.